DO YOU KNOW A VET? Help him or her to get here. The American Flag that was destroyed in the collapse of the World Trade Center on September 11, 2001 is being stitched back together seven years later by tornado survivors in Greensburg, Kansas. That National 9/11 Flag is a testament to American resilience and compassion. Be a part of the historic stitching ceremony to repair American Flag destroyed on 9/11. Nominations must be received by November 1 and must be submitted online at www.National911Flag.org by clicking on “Nominate a Service Hero.” In addition members of the public are invited to visit the website and “Sponsor A Stitch” for $5 to help underwrite the restoration of this national treasure. The New York Says Thank You Foundation is currently taking The National 9/11 Flag on a journey across America. Local service heroes are stitching the flag back to its original 13-stripe format using pieces of fabric from American flags destined for retirement in each state. 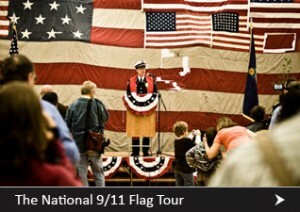 On November 9, 2010, The National 9/11 Flag will make its way to Branson, MO. FDNY firefighters will be onhand to assist local service heroes and veterans in the stitching ceremony to help sew the Missouri restorative patch onto The National 9/11 Flag. By the 10th Year Anniversary of 9/11, the flag will be restored. The National 9/11 Flag will become a part of the permanent collection of the National September, 11 Memorial Museum built at the site of the World Trade Center. The mission of The New York Says Thank You Foundation is to commemorate the generosity extended to New Yorkers by Americans from all across the country in the days, weeks, and months following September 11. The foundation will send volunteers from New York City each year on the 9/11 Anniversary to help rebuild communities around the United States affected by disasters. The New York Says Thank You Foundation is proud to be the national custodian for The National 9/11 Flag. Plan your Branson stay: The Welcome Center is at the intersection of U.S. 65 and Highway 248 (Red Route). Make this your first stop in Branson for friendly faces, free maps, brochures with coupons, Branson Vacation Guides, coffee and clean restrooms. Branson activities and accomodations: Branson/Lakes Area Convention and Visitors Bureau.